Renowned British handbag designer Lulu Guinness has created an exclusive tote bag for the Friends of The Royal Marsden, the UK's leading cancer care hospital based in Chelsea, London. 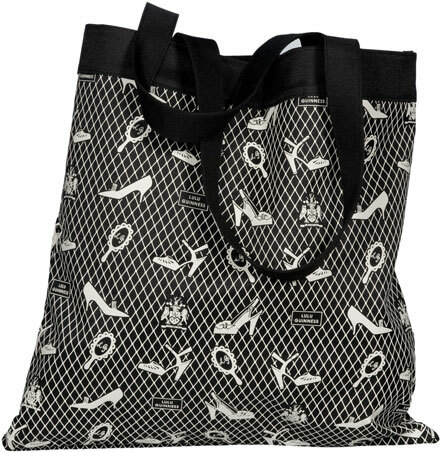 The bag features a fishnet design with her signature high heels and handheld mirror motifs. It's perfect for carrying your shopping in style whilst supporting a worthy cause. It retails at £15.00 (+£2.50 P&P) and you can orders yours now from The Royal Marsden with 100% of the profits going straight to the charity. That's a really fun tote bag! And that's great that all money is going to charity! Oh wow, 100% going to charity? That's amazing! It's such a lovely bag, it's great that all the money is going to charity too.